And you will also be able to win some blog candy, just go over to Susana's blog and enter to win, she has really outdone herself with all the goodies she is giving away. The blog candy started on Sunday, so make sure to sign up today or later this week. My post for the blog hop will be up at 4 am est, which is 1 am my time (I will schedule the post for that time because I will be in bed sleeping at that particular hour ; ) I am also going to give away some blog candy, just haven't figured out what yet, so make sure that you revisit AfterHoursStamper.com on Friday for the blog hop. And now...my confession. My stamp area is a disaster. Not just a mess, but a disaster. I have been making so many cards lately I just haven't had time to pare down the pile, and now I am working on a very small portion of my stamping area (and my stamping area is small to begin with). You see that littttttttllllle area with the new Tim Holtz Sizzix? That is my entire work area right now, the pile on the bottom of the picture is taking up my should be free space...sigh. So this week I am NOT making any more cards until I get that pile sorted (there is paper, stamps and lord knows what else in that pile...sigh). It works....for now anyway, but I really need to finish organizing my stamps and all my stuff. I must have 50 ink pads that I never use, but won't part with...sigh. Anyhow...onto other things. These are paint paletts from Jerry's Artarama (I looked everywhere and these were the best deal and best solution for me). I printed out this chart from Ranger, and then put the colors in the pallets in the same order as the chart. I used water color paper to make the samples of the colors (a must in order to know what you are doing and to be able to use certain combinations again.) I am loving the pallets, and there are also extra paint areas left in case I want to mix and save a combination of distress ink! Punch and Emboss tool: These look very interesting, and I did order some from another company (which I love), but am also considering these. And some videos! First up one of Tim Holtz's videos on his new Sizzix die (and you can see that I purchased one already). NOTE: You can use these in your Cuttlebug, I used two B plates and make perfect cuts, no other plates, just the two B plates. I love these flourishes (first used them when I bought a pack of his precut grunge board), and can see that I will be using this die many, many times. You can see the other two videos on Tim's blog, click here for the post. Time for Crafting has 18 other videos, click here to check out some of the other offerings she has for you. Ha ha Jacquie!! Too Funny... My stamp area is fairly large, and I still do frenzy stampin' as I call it, working myself into a corner or tiny little space. At some point, we have to stop and clean it all up to find stuff don't we?? Love that someone else out there stamps in a kingdom of clutter!! The creative ideas just keep rolling in, and we just can't stop for trivial little housekeeping stuff! HUGS!! 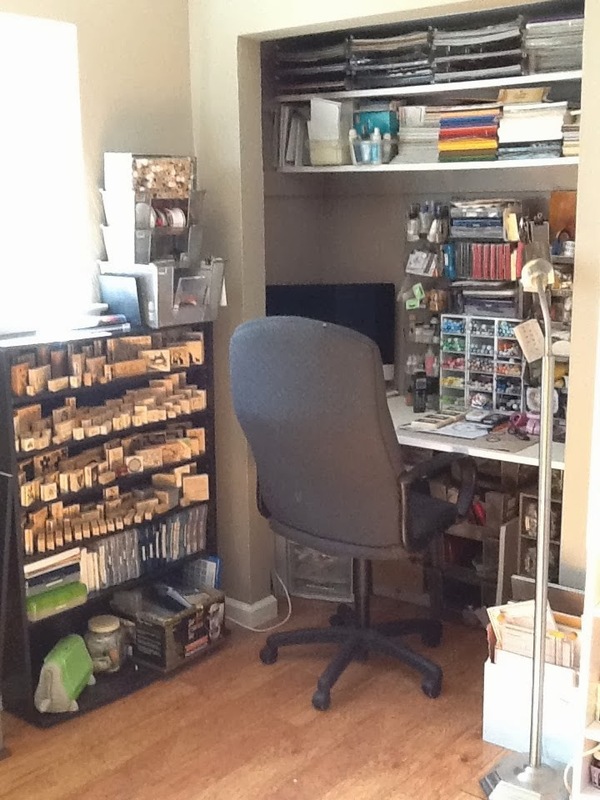 Your workspace and mine look uncannily similar right down to the amount of free space actually available for working. And the stamp pads? I had to go & count...50 plus and that's not counting the distress inks and multicolour pads! Oh dear. We all find our comfort zones in our work space, don't we??? I have to pick up before I work on the next project, or it makes me crazy!!! I love the Brayer viseo- I have taken Michelle Zindorf class- too funny-I hold my brayer like a wheel- like in this video.....Michelle asks you hold it by the handle with your pinky up if you do that, so you get en ink pressure.......Beautiful card! I will look forward to Suzanna Deans blog hop this weekend! thank you for the tutorial on the brayer, beautiful!